This past weekend, I spent all of my time "home making". I cooked, cleaned, organized and planned my little heart out. By Sunday, I was exhausted but felt great about the progress I had made. 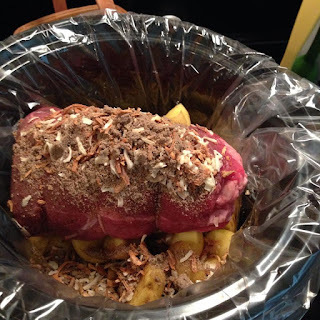 Below, you will find my favorite recipe for pot roast. Also take a look at the link to my Pinterest profile in the left column on my blog. You will find tons of resources and ideas to try in your own home. I also use Reynold's Wrap Slow Cooker Liners. Here is a coupon for the liners. These are so handy and make clean up a breeze. Wash and cut potatoes into quarters. When I cut them smaller that quarters, they get mushy. 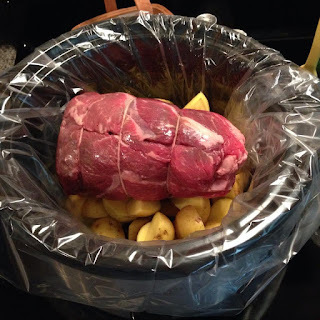 Place the potatoes in the bottom of your Crock Pot and add roast and two cups of water. Next, add both packets of dry soup mix. Cover and cook for eight hours on low heat. 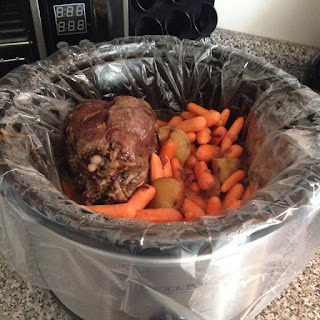 Turn the pot roast once or twice during cooking time. This isn't necessary but I like to turn to make sure it is cooked evenly. About six hours into the cooking time, add the bag of baby carrots. Look how yummy it turned out! After you empty the food from the slow cooker, simply lift out the Reynold's Wrap liner and toss in the trash. How is easy is that?! ?